Welcome to your new home: your very own villa apartment within a four star rustic Tuscan farmhouse. Embark upon a cultural adventure as you explore two medieval villages, Anghiari and Arezzo. 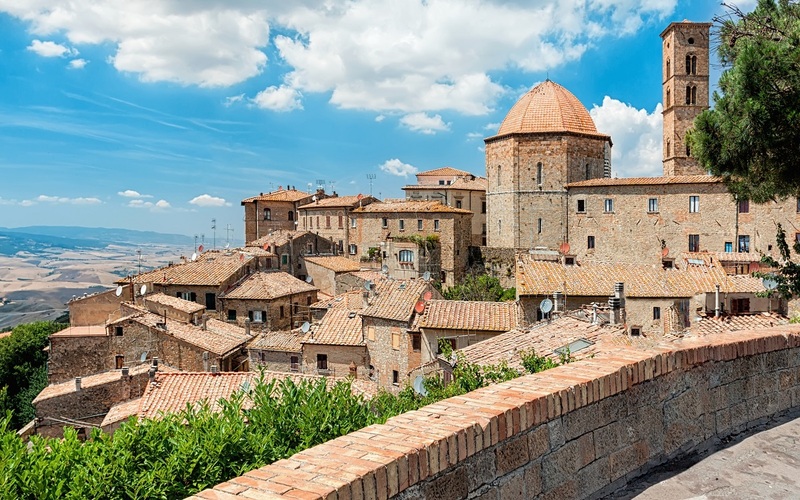 Get a true feel for historic Tuscany and take a trip to Volterra and San Gimignano. Embrace the ancient folklore of an authentic Tuscan village. Experience the wonders of the true Tuscan countryside in Val D’Orcia. Explore the fascinating city of Siena and its surroundings. Get a real taste for Tuscany on a visit to the local wineries. Your trip will commence on Saturday, when our driver will meet you at the main entrance to Florence Central Station. First, we’ll whisk you away to your new Tuscan home, a gorgeous villa apartment located within an authentic Tuscan farmhouse. During your stay in the farmhouse, you’ll find yourself enveloped in lush greenery. Here, you’ll find a working farm with lots of animals, a sizeable swimming pool, a restaurant for your breakfast and dinner, a laundry room and wi-fi internet access. Once a tiny village, the farmhouse is now divided into 12 private villas/apartments. Whilst all the guests will be accommodated within the farmhouse, each will have their own private lodging and facilities. We’ll kick off our week with a trip to see two wonderful towns in South-eastern Tuscany. You’ll be transported by our driver and escorted by our tour manager. Once in Arezzo, our first stop, you’ll meet a local tour guide who’ll be ready and waiting to tell you all there is to know about the history and secrets of Arezzo, Florence’s former foe. Traditionally known for its gold-smithery, Arezzo is one of the richest cities in the region. Although its Medieval centre was largely demolished in WWII, Arezzo is still home to many fascinating churches, monuments and museums that each invite the town’s visitors to take a step back in time. Housing Piero della Francesca’s amazing Early Renaissance fresco cycle, the Legend of the True Cross, the Church of San Francesco is possibly the most famous church in Arezzo. 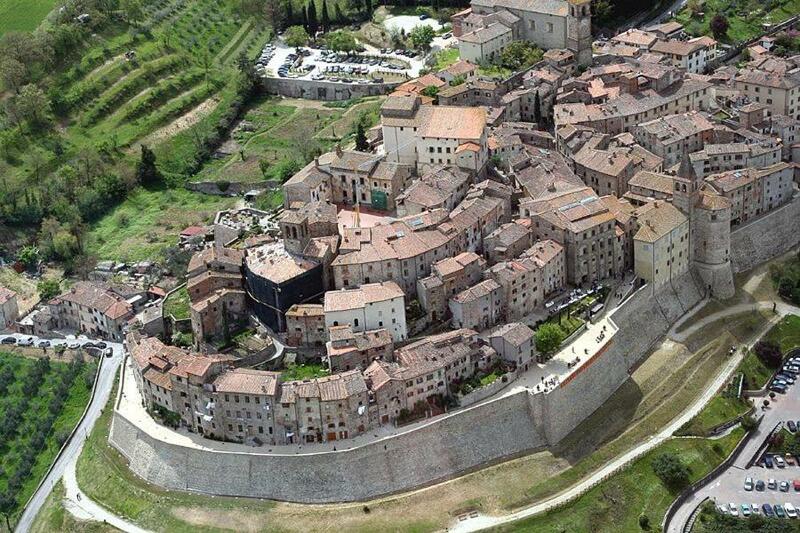 Next, you’ll journey uphill to see the Piazza Grande and Medici Fortress. After this, you’ll take in the Cathedral dedicated to San Donato before returning downhill to see the Roman Amphitheatre and, finally, the wooden Crucifix by Cimabue in the Church of San Domenico. Although Arezzo has a lot to offer, Tuscan tours rarely stop here. If you’re staying for a week, we recommend a day trip to Arezzo and a journey into the surrounding countryside. 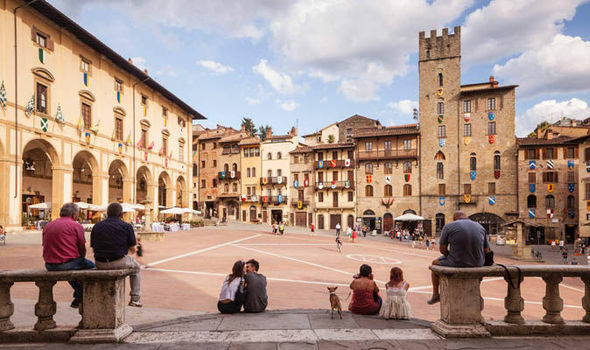 Arezzo offers fewer tourists, more local residents and abundant treasures hidden in the castles and towns that all played a central role in the region’s history. Together with your tour guide, you’ll explore the town until lunchtime. Once lunch is over, we’ll continue our journey to Anghiari, where you can enjoy your Sunday afternoon. Approximately 30 km from Arezzo, Anghiari sits in the Tuscan Valtiberina valley, near the Umbrian border. A quaint medieval charm, Anghiari is perched on a stone hill, crafted throughout the centuries by the Tiber River below. Bursting with character, the town is closely guarded by its imposing 13th century walls, which have protected its medieval atmosphere and preserved its ancient identity. A stroll through Anghiari’s narrow streets will immerse you in its past and splendour. With tiny windows and quaint wooden shutters and doors, the stone houses are very charming, despite some broken panes here and there. Flowers hang from many of the doorways and balconies, colouring the narrow streets and making them even more delightful. Celebrated as “one of Italy’s most beautiful villages", the Italian Touring Club has awarded the village with an Orange Flag award, stating that the town represents a medieval treasure, nestled between the Tiber and the Arno rivers. When you’ve seen all there is to see in Anghiari, we’ll travel back towards the farmhouse, making just one stop at a traditional Tuscan winery. It will be here, in Chianti Aretino, that you’ll experience your first wine tasting session. 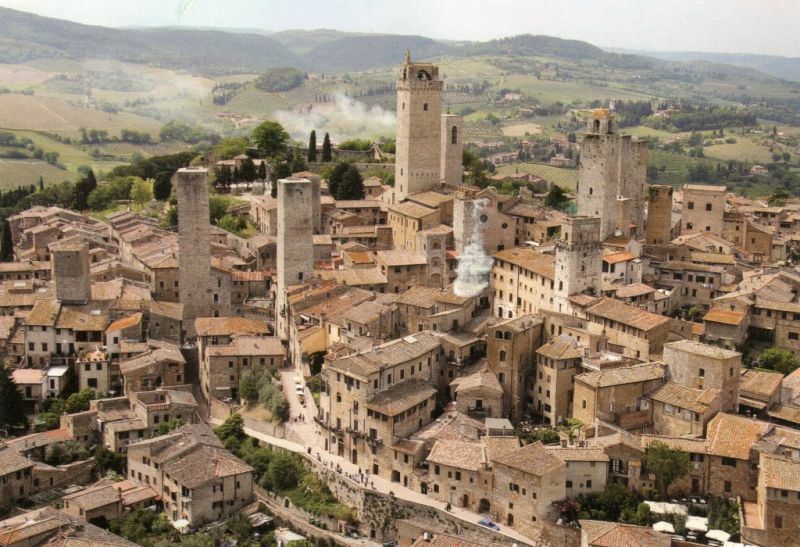 On Monday, we’ll journey to San Gimignano. Sandwiched between Florence and Siena, San Gimignano is a walled town with captivating architecture and impressive medieval towers that soar above the rest of the town, providing a wonderful skyline for those in the valley beneath. At the peak of its wealth, the aristocratic families in San Gimignano built 72 towering houses as representations of their power and affluence. Whilst there are only 14 of these towers remaining today, San Gimignano still looks and feels very feudal. Since 1990, San Gimignano has been a UNESCO World Heritage Site and its visitors are all invited to journey back in time as they sample the local produce, including saffron and the local white wine, Vernaccia di San Gimignano. With free time to wander the town alone, you’ll be able to explore all that San Gimignano has to offer. Then, you’ll be escorted by your tour manager to a family-run winery where you’ll sample some of the best local produce during an excellent lunch, all washed down with a sample of the famous Tuscan white wine. Once lunch is over, we’ll journey on to Volterra before returning to the farmhouse. Sitting in the province of Pisa, Volterra is a charming town just a stone’s throw from Florence, Siena and the coast. Famous for its Etruscan origins and remnants, Volterra is well-known for having an unusual urban layout, typical of its Etruscan heritage. Indeed, you can still visit part of the majestic walls that were built around the town in the 5th and 4th centuries BC. Some of these walls include the Porta all'Arco and Porta Diana, two wonderfully preserved city gates and the Acropolis that contains the foundations of two ancient temples as well as a number of other buildings. If that’s not enough, there are also numerous Roman ruins for you to visit, including the Roman Theatre, built in a natural amphitheatre shape and dating back to the late 1st century AC. Cooking class ----> Firenze ---> Summer village festivals "sagre"
Tuesday will offer you two choices: you can either relax in the beautiful surroundings of the farmhouse or we can take you to the railway station where you’ll journey to Firenze by train. In the evening, you can experience a cookery masterclass, hosted by our local chef. During this class, the chef will assist you in preparing a delicious dinner. Between June and September, we’ll then team up with local villagers to celebrate at their colourful summer festivals, the “Sagre”. If you like wine, you’ll love our plans for Wednesday as the day is completely devoted to wine. Together, we’ll explore numerous wineries, cellars and castles and learn about the history behind the famous Chianti wine. During these visits, you’ll also discover and taste the fine extra virgin olive oil produced in the region. When we’ve tasted all the deliciousness Chianti has to offer, we’ll move onto Greve where you’ll find the most popular butcher and deli in the whole of Tuscany. This is the perfect opportunity for you to pick up some of the very best in Tuscan produce. On our journey back to the farmhouse, we’ll stop to savour an authentic Tuscan meal in a local family-owned trattoria. Thursday is all about relaxation and will give you the opportunity to relax with the locals in one of Tuscany’s most delightful hot springs. You’ll be driven straight to the gorgeous Natural Spring “Bagni di San Filippo”, situated in Val D’Orcia. You’ll be transported to another world altogether as you unwind amongst the woodland, enjoying the calciferous formations, waterfalls and small hot pools that lie just outside the small town of Bagni San Filippo. The area is fairly extensive, and you’ll find that that first pools you come across near the road are quite shallow. Because they’re not very deep, they don’t stay warm for very long. We recommend following the path into the woods for a little longer as you’ll soon come across the huge calcium formation and waterfall known as the “White Whale”. Nearby, hot springs reach 48°C as they rush out of the ground. Here, you’ll be able to immerse yourself in nature and truly unwind. Whilst you may choose to simply enjoy the hot spring, you could book a treatment or two at the Terme San Filippo Spa. The spa delivers all of its services against a backdrop of sprawling park, steaming hot canals and lush vegetation typical of the Val D’Orcia countryside. On offer, you’ll find numerous thermal treatments including baths, mud baths and inhalation therapies. Also, Terme San Filippo offers a number of face and body treatments and sells a range of beauty products. Once you’ve had lunch, we recommend taking a quick shower at the spa before preparing for some wine tasting in Montalcino, a lesson on “Brunello" red wine and a trip to discover the enchanting village of Monticchiello. In the late afternoon, you’ll be transported back to the farmhouse where you can prepare for another authentic Tuscan dinner at an on-site trattoria. On Friday, our final day, our tour manager will take you to see the stunning city of Siena. Here, a local tour guide will greet you and tell you all there is to know about the city’s secrets and history. We think that Siena is Italy’s most beautiful medieval city and believe that a trip to Siena is an absolute must, even if you’re only in Tuscany for a short time. At the heart of Siena is Il Campo, the city’s central piazza. Famous the world over for the Palio horse race that encircles it twice each summer, the piazza has also seen fame on the big screen, with Siena and the horse race both featuring in the James Bond title Quantum of Solace. The huge piazza once housed the Roman forum and is nestled between the three hills upon which the city is seated. It features a fan-like brick pavement that symbolizes the Madonna’s cloak which is said to shelter the city. It is divided into nine sections to represent the Council of Nine, a quasi-democratic group who ruled over Siena between 1287 and 1355, when the piazza was rebuilt. The red Palazzo Pubblico and its tower, the Torre del Mangia, loom over the piazza. The Palazzo, or civic palace, was also built during the rule of the Council of Nine, along with the Duomo of Siena. Constructed between 1297 and 1310, the Palazzo still houses Siena’s municipal offices, much like the Palazzo Vecchio in Florence. The Civic Museum and Torre del Mangia can both be accessed via its internal courtyard. If you find yourself with some spare energy, a brief climb up some 500 steps will provide you with a stunning view of Siena. After lunch, we’ll transport you to Monteriggioni before returning to the farmhouse for the last Tuscan dinner of your trip. 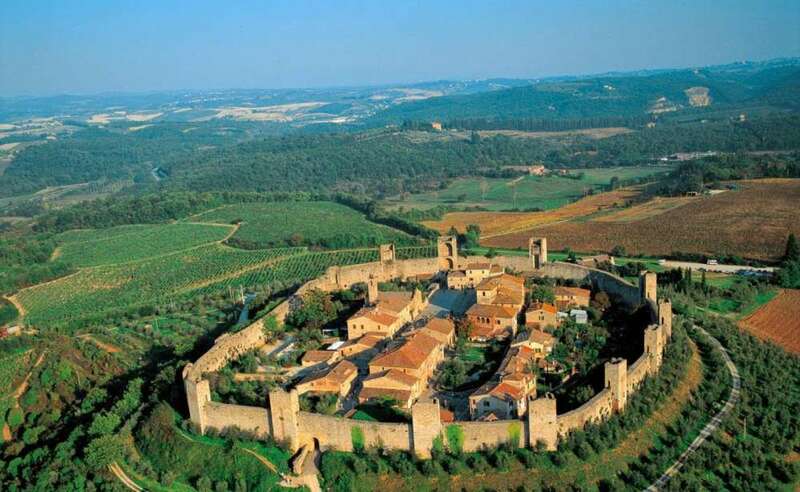 In Monteriggioni, you’ll find one of the largest walled castles in the region. With a wonderfully preserved structure, you could be forgiven for thinking that no time had passed on the hill from which it dominates the skyline. Carefully tucked into the province of Siena, Monteriggioni sits between Siena and Colle Val d’Elsa. With a perfectly circular perimeter, you could also be forgiven for thinking that the city’s outline was man-made. In fact, the city walls simply follow the natural curves of the ground upon which they sit. The fortified wall, still intact, contains 14 towers which were once used by the guards who patrolled its length. It also contains two gates — the Florentine Gate, facing Florence, and the Franca or ‘Romea’ Gate, facing Rome. On Saturday, you’ll enjoy a delicious breakfast before being safely transported to Florence railway station. It’s here that we’ll part ways and your Tuscan tour will conclude. A surcharge of 400 AUD per person will be apply if you request a “private tour”. 8 people per week to ensure that client needs and enjoyment is always our top priority. 1. Private Villa/Apartment in a 4 star farmhouse accommodation. with set menu composed and house wine included. 11. GST, Tax, Tolls, Petrol. As the availability could change, it is advisable to send your enquiries anyway.